It's July and it's time for another #CampusHero network and chill meet up. 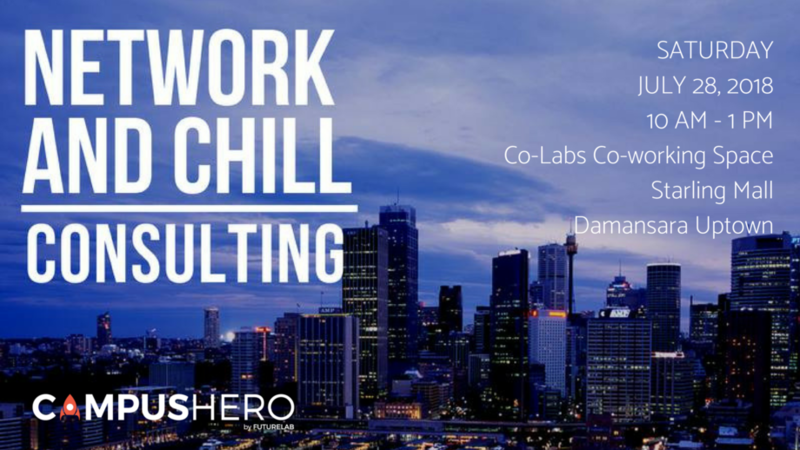 The CampusHero team would like to invite you to our upcoming July Network and Chill meetup! The purpose for the meetup is to enable students and mentors to mingle in a free and casual manner, in hopes that the two parties will be able to learn and gain as much as possible from the free exchange of dialogue, ideas and stories. This time around, we will be bringing in mentors from #consulting! Mentors from Accenture, PwC and many other famous consulting firms will be there. So if you have any specific curiosity, inquiries or just general wonderment about consulting, do join us and have your curiosity satiated! 1. You could learn and explore more about a career in consulting. 2. This is a chance to network directly with consultants from renowned consulting firms. This is the platform to build your network into consulting. Expand your network with FutureLab, help guide 6710 students and young professionals in their career. Give back to the community, become a FutureLab mentor today!